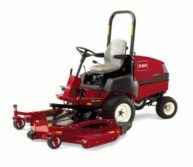 The Groundsmaster 3280-D, all-purpose mowers embody the Toro standard for durability, yet are refined to meet today’s more stringent cutting demands. The deck shells are constructed from high-strength 7-gauge welded steel, 33% thicker and 75% stronger than ordinary 10 gauge commercial steel used in 7/10 decks. The patent-pending adjustable baffle design on the 72` (183 cm) Side Discharge and 60` (152 cm) Side Discharge allows operator to quickly fine tune cutting performance to meet changing turf conditions. The adjustable front baffle position is easily moved in a matter of seconds without any tools. The cast iron spindle housings feature a massive 9 inch (22.9 cm) diameter base and eight-bolt mounting pattern that spread impact loads across a broader area of the robust deck shell. Combine that with the high-efficiency, tapered roller bearings that offer greater durability than spindles that use ball bearings. The result is greater stability and strength, providing longer deck and spindle life. 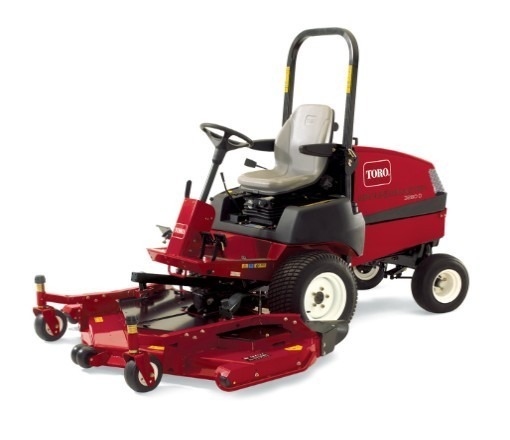 The large 11.3 gallon (42.8 litre) fuel tank provides capacity for all-day mowing. Tight wheel base, power steering, and individual steering brakes allow for expert handling and increased productivity. The new electric-clutch deck engagement is smoother than the manual systems and the new air ride seat suspension glides over the bumps. The discharge deflector on the 72` (183 cm) side discharge and 60` (152 cm) side discharge decks is constructed of durable 5/16` (8 mm) thick rubber and allows for close trimming without damaging chute or landscape structures. Patent-pending design provides exceptional dispersion. The high-strength one-quarter inch (6 mm) thick heat-treated alloy steel blades resist flexing and abrasive wear. The result is a crisp cut time after time. An innovative bi-directional overrunning clutch senses traction needs. Extra-large tread tires and counterbalance system further enhance traction and stability. The Groundsmaster® 3280-D has a choice of seven decks to match your mowing needs, including: 72` (183 cm) Rear Discharge, 72` (183 cm) Side Discharge, Guardian 72` (183 cm) Recycler, 62` (158 cm) Rear Discharge, Guardian 62` (158 cm) Recycler, 60` (152 cm) Side Discharge and 52` (132 cm) Side Discharge. High-efficiency, tapered roller bearings offer greater durability than spindles that use ball bearings.